Part 1: Why Keystone sits at the heart of this decade’s most significant battle between eco groups & fossil-fuel interests. The American portion of Keystone pipeline under construction near Swanton, Nebraska in 2009. Onlookers must have been astonished when the world’s largest mining truck took up residence on the Washington Mall, a stone’s throw from the U.S. Congress. Half the height of the White House, the truck could comfortably fit an entire mid-sized car inside each wheel. This mine truck, parked in downtown Washington in the summer of 2006, was a triumph of political salesmanship by Ralph Klein, a populist pro-business politician who was then premier of Alberta. Klein had watched trucks exactly like this one many times before, usually in the company of foreign dignitaries and magnates as they toured oil deposits near Fort McMurray. 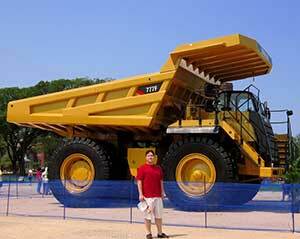 The premier was used to the size, scale and shape of the trucks. He had seen dozens of them in tandem motion, as, one at a time, they would accept staggering shovel loads of sticky black bitumen mixed with sand, and drive their 300 to 400 tonne payloads out of man-made canyons to dump the bitumen into a gigantic centrifuge. In his time as premier, Klein had seen the enormous tailings pools in the north of his province fill with a mixture of water, sand, oils and clay. He had witnessed the high-temperature alchemy that transformed the tarry bitumen into some of the world’s lightest and sweetest crude, along with the denser mixes of “dilbit,” “synbit” and a host of other products broadly called oil sands. More than anyone, he knew the royalty potential of the oil sands, the jobs and the opportunities they meant for Canada, the U.S., and especially Alberta. If only more investors would come. If only the markets could be secured. The truck was part of a larger plan. The Smithsonian Institute, a custodian of American cultural history and treasures, hosts an annual Folklife Festival that brings attention to various domestic and international topics. The Klein government had secured a spotlight for Alberta within this cultural festival. It was an avenue for sharing the province’s diverse cultural traditions, First Nations and spectacular landscapes. The festival was also a forum for simultaneously putting Alberta’s oil sands in front of the captains of American government and industry. Back then, the potential of the oil sands may have been known to energy insiders, but for the general U.S. public it was completely off the map. Klein planned to change that. It was the height of the Iraq War and D.C. was dominated by Texans. Klein’s goal was to get the message out that Alberta and its oil sands were ‘open for business’. He called upon U.S. business leaders and politicians to look to their friendly neighbour to the north for energy security. He presented the oil sands as a symbol of the special relationship between Canada and the United States. He pointed to the massive mine truck as an embodiment both of the scale of the potential resource in play and the innovation needed to unlock it. What Klein did not expect is that this same heavy hauler would spark a call to arms for what has become the most significant battle between environmental groups and the fossil-fuel industry this decade: the battle over the Keystone XL pipeline. Nearly a decade later, in February 2015, U.S. President Barack Obama would personally veto a bilateral bill to approve the Keystone XL pipeline. That a sitting U.S. president would directly engage in an infrastructure decision is surprising. That he would come out against it in opposition to some members of his own party – not to mention the personal appeals of Canada’s prime minister – is astonishing. Some activists are already declaring victory. After the veto, Greenpeace U.S. executive director Annie Leonard noted that all President Obama needs to do now is instruct the State Department to “put the final nail in the coffin of Keystone XL.” With oil worth half what it was a year ago, Keystone’s importance to the growth in the Canadian oil sands industry has grown even as the case for it has been eroded by a glut of U.S. shale oil. A shadow of fear can now be felt in Alberta: could the oil sands’ moment have come and gone? Is there any way to reconcile the imperative for curbing global greenhouse gas emissions with continued development of Canada’s oil sands? Pundits speak in knowing terms of how the Keystone XL pipeline decision will profoundly change both the oil sands and the environmental community. The reality is that it already has. Near the close of the 20th century the oil sands were known in the industry as a sure place to find oil, and to lose money. This began to change when “supermajor” Shell announced in 1999 that it would move forward on the first new oil sands mine in 20 years. At the time, two mines and one steam injection project collectively produced about 700,000 barrels a day of crude oil, dwarfed by conventional production from the rest of Canada. Regardless of the vast scale of the resource, no one was beating a path to Northern Alberta. Shell itself had twice sent its project back to the drawing board. Concerns included the big upfront investment with uncertain returns, and the potential negative reaction from environmentalists over the project’s greenhouse gas emissions. In context these concerns make sense. At the time, oil prices were at about $10 per barrel in today’s dollars, and some thought it could fall to as little as half of that. Natural gas, which is the main input for separating oil from the sands, was about twice as expensive as today. At the time, the world appeared poised to make firm commitments on carbon, with the European governments set to launch an international emissions trading system in 2005. Shell’s play was high risk, and everyone on the project team knew it. What motivated Shell to take the risk was a contrarian insight: the oil sands’ business case is the opposite to the oil production business case in almost every other part of the world. Most of the world’s remaining recoverable oil lies in inhospitable environments (e.g. deep under the ice and waters of the Arctic) where drilling an accurate hole into a known reservoir is next to impossible. Or the oil is in countries where major publicly traded petro-companies are unwelcome. Big international oil companies bring technical expertise and financing, but also potentially unwelcome transparency to regions where oil production is expected to benefit the monarchy first, not the shareholder. In the few situations where independent oil companies are allowed to operate, they usually only get a “postage stamp” fee of a few dollars a barrel for delivering oil from the ground to a local refinery or port. Reducing costs, in other words, does not mean making more money, and technology investment is a low priority. On top of this, investments are subject to the whims of national and family politics. In contrast, Alberta’s oil sands are a vast and well-delineated resource with virtually no ‘dry holes’. With its stable democratic government, independent judiciary, and transparent tax regime, Alberta has little of the political uncertainty that marks many other possible opportunities. This makes oil sands a sure bet to balance riskier plays in a portfolio. What distinguishes the best oil sands projects from the worst is the quality of the sands acquired for development, and the execution of the project to extract the bitumen, with its combination of financing, technology, management and refining strategy. This favours deep-pocketed, sophisticated companies over small debt-leveraged entrepreneurs, or lumbering politically motivated state behemoths. And the technology upside in the oil sands is tremendous. If you can figure out a way of getting oil out of the oil sands more cheaply, you keep every dollar of that cost difference. Despite these attractions, a series of technological and financial innovations were needed before Shell and others would come to the table with the necessary megascale investments. This is where the Alberta government showed more foresight and gumption than its international peers. In 1974, the province established an arm’s-length organization called the Alberta Oilsands Technology and Research Authority (AOSTRA) to develop technology for getting oil sands out of the ground and transforming them into valuable products. AOSTRA has become the stuff of legends. It is often, and rightly, applauded for being a model of industry-government collaboration. The keys to its success included its political support, its independence and its single-minded focus on advancing the oil sands. Unlike the large oil companies who spread their research dollars across many opportunities, AOSTRA had the single goal of making the oil sands viable, with the aim of generating jobs and royalties in Alberta. 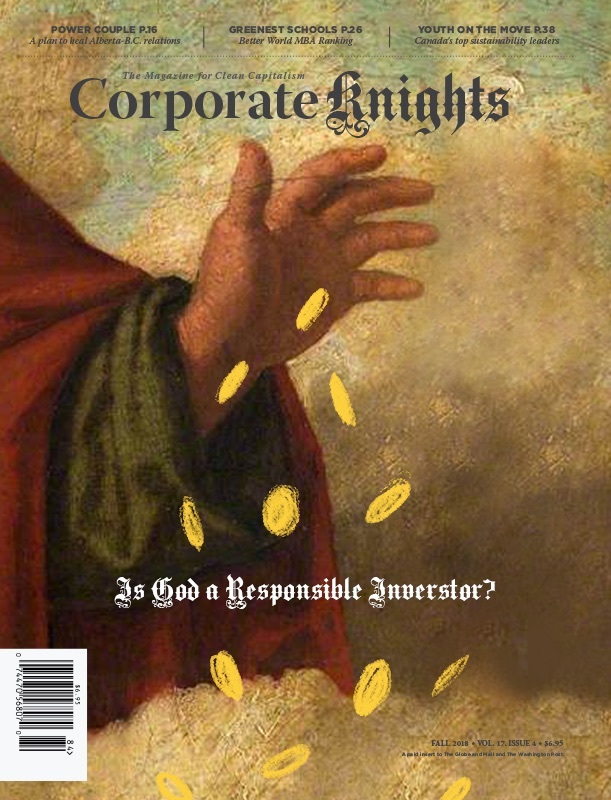 As a consequence, AOSTRA could go it alone and invest when companies would not. This marriage of industry, politicians and academics allowed the organization to toil for well over 10 years spending the equivalent of over $1 billion in today’s money from the public purse, considerably more if contributions-in-kind from industry are tallied up. AOSTRA developed many of today’s dominant oil sands production technologies, including the in-situ thermal process for recovering resources too deep to mine. AOSTRA also had a direct voice in all policy discussions: it was required to have one board member as a sitting member of the Alberta legislature, while the other directors had extensive industry and academic experience. Advancing the technology was necessary but not sufficient. To make the oil sands economically attractive, a new fiscal regime would be required to balance the interests of Albertans with the need to overcome the cost barrier and uncertainty associated with deploying these novel technologies. In 1993, the Alberta Chamber of Resources convened the industry- and government-represented National Oilsands Task Force to draft such a framework. Its 1995 report set out a 25-year game plan for growing the sector to a then-ambitious 1.2 million barrels per day of production by 2020. This would be done through a generous royalty regime and favourable federal and provincial tax breaks, which were adopted in 1997. While the original SAGD (steam-assisted gravity drainage) patent was awarded in 1969, the implementation of these incentives were likely helpful in enabling its first commercial deployment 27 years later. Even with this technological and fiscal support, many thought Shell’s oil sands mine would be a bomb. But by 2002 oil prices began a steep climb, led by China’s dizzying growth, while a couple years later natural gas prices began to fall. By the time Shell’s project got over its initial hiccups, Shell and its partners were well in the money, and oil companies from around the world started piling in. Under pressure from Alberta’s leadership, the U.S. Energy Information Administration and the influential Oil and Gas Journal reclassified the quantity of economically recoverable bitumen in 2003. 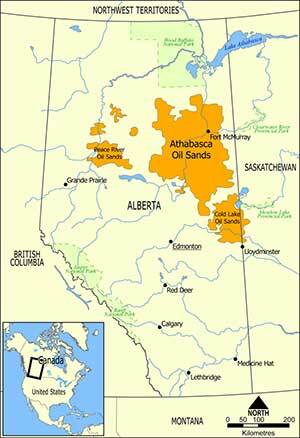 With a stroke of a pen Canada’s oil sands became the second-largest single reserve in the world next to Saudi Arabia. The result is that Premier Klein’s oil sands message started gaining significant traction in the investment community. Between 2006 and 2008, global markets and world oil prices continued their dizzying rise, and each week brought new dollars to Canadian oil-sands projects. Production from the oil sands was forecast to grow from roughly 1.2 million barrels per day to about three million by 2015. Some suggested that on the back of the oil sands, Canada could eventually meet 40 per cent of U.S. oil import demand. From about 2000 through to the financial crisis of 2008, oil sands fever was a reality. A roster of blue chip projects waited in line to produce from the oil sands. With that in mind, TransCanada was being sensible when in 2008 it proposed a dramatic expansion of its existing Keystone pipeline to the Gulf Coast. Its refiners increasingly needed to buy Canadian bitumen, and the Midwest was becoming oversupplied. It’s important to note that refineries are designed to operate on a narrow diet – a specific mix of inputs with limited variance, which are converted into a slate of products: mostly gasoline, diesel and jet fuel. Many of the refineries in North America are built for heavy oil such as the oil produced in Canada’s oil sands, in Venezuela, or in Mexico. But a combination of political intervention and state sponsored mismanagement meant that production in both of the Latin American countries was becoming increasingly unreliable. 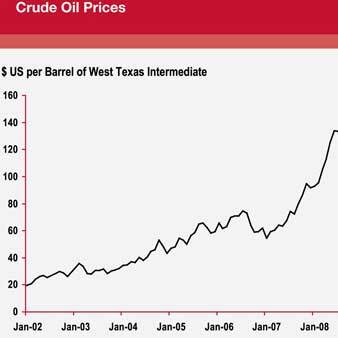 The refineries were willing to pay a significantly better price for Canadian heavy oil, if they could get it. The only bottleneck was limited pipeline capacity. At the same time, light oil production from the U.S. was growing quickly, and infrastructure to move this was simply unavailable. By expanding Keystone to carry both light and heavy oil, a lot of backs would get scratched. It was no wonder then that in 2011, hailing Canada’s rise as an emerging “energy superpower,” Prime Minister Steven Harper called the approval of Keystone XL by the U.S. State Department a “no-brainer”. But the decision over the Keystone XL pipeline would become the victim of the oil sands’ unanticipated success. Through an unmatched advocacy effort, Klein had successfully elevated Alberta’s bitumen deposits to international significance. At the same time, this escalation had brought with it an equal and opposite reaction from environmentalists. Instead of being viewed as the answer to U.S. dependence on Middle East oil, the oil sands would increasingly be framed in the public debate as a looming environmental tragedy. Keystone XL was characterized as its enabler, resulting in unprecedented opposition against its construction. About the authors: Dan Zilnik (dzilnik[@]ogsustainability.com) is president of Oil & Gas Sustainability Ltd., a Calgary-based consultancy. Jason Switzer is on an extended leave of absence since January 2015, prior to which he was co-director of the Pembina Institute’s consulting team.